Luckily, you don't have to know anything about nanotechnology to find the session fascinating. If you're interested in learning about nanotechnology or teaching about this, they have free modules and courses available at their web site, www.nano4me.org , and they will also post the slides from this morning's talk. Certainly it's a catchy term but it's not clear what it is exactly, at least not to me, so I appreciated the level of the talk and clear explanations. First, we heard from Dr. Fonash. In Italian, "nano" means "dwarf." In science 1 nanometer is 0.000000001 meters (or 10-9 meters). What are the unique attributes of the nanoscale? The Romans used nanotechnology 1700 years ago! 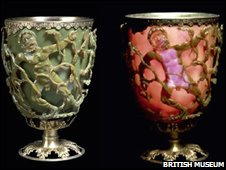 The Lycurgus Cup (above), in the British museum, has gold and silver nanoparticles embedded in glass. The stained glass windows in European cathedrals (e.g. the Notre Dame in Paris) have nanoparticles. Nanoparticles were put into ceramic plates in 16th century Italy. The ancient Phoenicians used sliver nanoparticles to treat infections. We haven't been able to figure to figure out how to copy what the ancient Roman, Arab, or European techniques but we have been able to show that nanoparticles are in the materials. Today, we use nanotechnology in many, many places. There are more transistors made from nanoparticles than there are grains of rice. One of the big tools is Electron Microscopy and we can use it to make things. Nanotechnology uses lots of types of Electron microscopy and we can both see atoms and push them around. You can even see the probability density of the electrons! (in a quantum corral). Transmission EM, Scanning ElEM (SEM), Field Emission Scanning Electron Microscopy (FE-SEM), Atomic force electron microscopy and scanning tunnel EM. Transistors are made through nanotechnology. So are bikes. A BMC bicycle uses carbon nanotubes and weighs 2 pounds. Dr. Travis Benanti talked about nanotechnology and energy. He discussed the research for using nanotechnology can be used to improve solar cells, which can help address energy problems. Current solar cells have some problems because they're fragile, rigid, and expensive. He also talked about quantum dots. Now we're hearing about cancer cells labeled with Quantum Dots. We saw a movie where cancer cells were grabbing EGF ( epidermal growth factor) and bringing it into the cell. MRI imaging can can be enhanced using quantum dots. The NCI has a web site with all kinds of movies showing the things that nanoparticles do in medicine. Tumors can be targeted for killing by using nanoparticles. You would use the quantum dots to help you prove that the drugs attach and get taken inside the cell. There are exciting things ahead for nanotech.